Discover the PIXMA Home Office TR8560, a printer made for convenient high quality photos, documents & scanning from the comfort of your own home or smart device. This product is now covered by Canon Print Assist™. 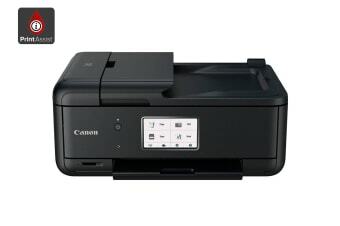 Get step-by-step tips to help you set up and connect to your printer with video tutorials, or use our handy 7 day a week helpline. Plus have extra peace of mind with Canon’s replacement promise. Experience a lean, space-saving design. Clever contrasting textures, rounded corners and tapering contours make the printer’s already-small frame appear even smaller. A superb printer inside and out – and an elegant addition to any desk or home office. Print quality documents with sharp crisp text over USB cable, Wi-Fi, Wired Lan or Bluetooth. Its document removal reminder, 2-way paper feeder in addition to duplex print via ADF makes printing at home easier than ever. Not to mention that Canon’s inkjet print technology and 5 single inks bring convenience, cost savings and great-looking prints. A4, A5, B5, Letter, Legal, Envelopes, 4" x 6", 5" x 7", 8" x 10", Custom Size, 5" x 5"